Oh I loved these books (and the cartoon) as a child. I particularly remember a book when Madeline gets sick and has to go to the hospital and how scared she is. Then everyone is so happy to welcome her home when she is better. I can't wait to read these books with my little girl! One of the best things about having having kids is being able to share the things that you loved as a child with them. 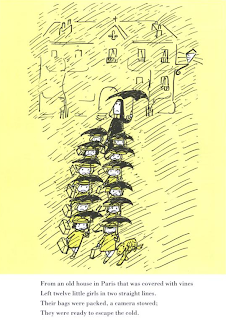 I remember reading about the “twelve little girls in two straight lines” who lived in Paris under the watchful eye of the benevolent Miss Clavel… the Madeline books were utterly charming and are still timeless today. It's hard to believe that Ludwig Bemelmans' beloved character is 70 this year! Bemelmans' grandson is carrying on the family legacy with the first new Madeline book in nearly 50 years. 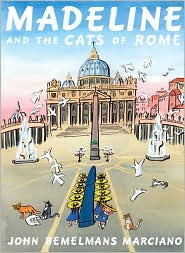 Madeline and the Cats of Rome find Miss Clavel and her charges escaping the dreary drizzle of Paris for the bright skies of Rome. The story and artwork are very true to the original series and I was pleased to be able to share it with Roo. Award-winning toy company Kids Preferred has launched a special collection to celebrate Madeline's 70th birthday. There are plush versions of Madeline and Genevieve, plus additional outfits and my personal favorite, the Talking Madeline Doll (a Toys R Us exclusive!). To enter and win your own Talking Madeline Doll, please comment on this post with your favorite Madeline memory. Entries will be accepted through December 2nd and I'll pick the winner using Random.org. US readers are eligible. For an additional entry, post my button on your blog (see code on sidebar), follow my blog, follow me on Twitter, fave me on Technorati or subscribe via email or subscribe via reader. Leave an extra comment letting me know what you did for each additional entry. Make sure you leave an email address in your comment or that you have one accessible on your blog so you can be contacted if you win! Disclosure: we received a free copy of Madeline and the Cats of Rome and a Talking Madeline Doll to facilitate this review and giveaway, mes amis. My favorite memory of Madeline is all the wonderful books. We would go to the library and bring some home for my mom to read to me. Nothing better than that! Thank you! I'm subscribed through Google reader. I remember how sad I felt for Madeline when she woke up crying in the night and Miss Clavel running, and of course, the dog Genevive! It's Madeline! In an old house in Paris. What a sweet gift for a little girl (or mom). I have so many memories of reading Madeline in bed under the covers (yep, with a flashlight). Roo is all ready to visit Paris. madeline was becky's absolute favorite cartoon when she was little! i always liked it when the nun would say 'something is not right. something is quite wrong.' and run down the loooong hallway and up the many stairs to the girls' room. btw~ i really don't mean to sound like a stickler, but the people that make 4 or 5 one lined comments, are they entered into the contest that many times or just once? i don't enter very many, so i really don't know. thanks! I love that she's fearless. Taught me to be a little fearless myself as a kid. My favorite Madeline memory is being able to read the stories I loved as a child to my own girls. My daughter still has her well loved Madeline doll in a blue dress. I loved reading Madeline when I was little I always wanted a dress just like hers! I remember reading all the books. Reading the books to my younger sisters, it was their favorite bedtime story. We always talked afterwards of we thought Paris was like. I remember reading Madeline in the comics. FUNNY! I am a subscriber by RSS Feed. My (middle) name is Madeline, too, so I always identified with and loved Madeline as a child. I envied her, too, because she had a dog, Genevieve, and I was never allowed one. I love that she knows her 1 through 7s. My French is pretty rusty, but I'd love to take it up again. Though I'd need more than a talking Madeline. I follow you on Twitter (@HSBSuzanne). I honestly don't remember Madeline, but I can imagine that my daughter would LOVE this doll! My favorite Madeline memory is reading the books to my nieces whenever I babysat. I don't remember seeing the cartoon much, but it goes along with the good memories of Babar and other shows that aren't on TV much anymore. My daughter has red hair, so I'm thinking she should be Madeleine for Halloween next year! Sooo cute, and this doll is adorable. Thanks for the great giveaway! I faved you on Technorati (HSBSuzanne). I'm subscribed via email, too. I did not see this until I was an adult, but even then the rhyme just mesmerized me! Miss N and Miss C enjoyed watching the Madeline movies when they were younger. I will see if I can find our book we have for Miss E.
Cute video & I spot Doraemon in the background hehe! I think my favorite Madeline memory was reading Madeline and the Bad Hat for the first time... I had never read a story that expressed such a sincere message of kindness to animals, I've loved Bemelmans work ever since... still a HUGE fan of Madeline! I didn't know the grandson was carrying on the legacy, will definitely have to check out the new-er book sometime. sadly I dont have any memories of madeline. however, my daughter LOVES her, we read it almost nightly. I remember my mom reading the books to my sister and I, and us wanting to visit Paris so badly! I didn't know about Madeline when I was a kid. I do remember seeing a doll a few years ago and thought the little scar was a cute addition. And I've got your button.